1. Elephants save little calf stuck in mud. This group of elephants put their strong trunks to good use when one of their little calves found himself stuck in the mud. The group worked together to push and pull the little elephant out of the slippery mud pit and get him back to safety. 2. Dog leaps to rescue friends in a runaway canoe. This gallant dog leapt to the rescue when two of his friends found themselves drifting downriver in a runaway canoe. The tide was strong, but this pup was quite the paddler, and managed to grab the rope and pull the other dogs back to shore. 3. 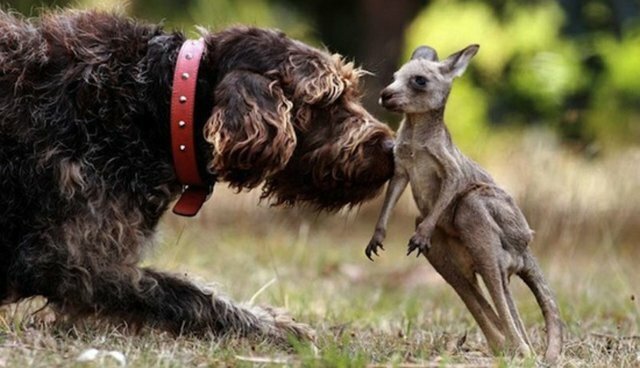 Dog's keen nose saves baby kangaroo after car accident. Rex, a 10-year-old cross between a German shorthaired and wirehaired pointer, was out for a walk with his owner Leonie Allan when the two passed a kangaroo who had been hit my a car. Thanks to Rex and his astute nose, however, the baby joey that was hidden inside the mother's pouch was saved. Says Allan, "He started pointing... I was worried he'd found a snake and called him back, but when he returned he dropped the joey at my feet." Rex was very tender with the baby, and the two even started cuddling together. The baby was cared for at the Jirrahlinga Wildlife Sanctuary, and then released into the wild when it was 18-months-old. 4. Hippo rescues wildebeest and baby zebra from strong currents. This extraordinarily helpful hippo in Tanzania's Mara river saved both a wildebeest and a baby zebra from being swept away by the strong currents as they began their migration to the southern Serengeti. The hippo would position himself downriver of the animals and nudge them along to the other side. After the hippo helped the baby zebra make her way to a little river island, he waited until she made it across safely. Says Tom Yule, and expedition guide who filmed the ordeal, "The hippo got out of the water and came up behind the foal and started nudging it and gently biting it on its backside as if to say, 'Come on man, don't give up now, you can do it. Just a hop, skip and a jump and you're there.'" 5. Rottweiler saves his chihuahua friend from a hungry coyote intruder. When Trixxie the chihuahua was left alone for a moment in her driveway one morning, a coyote thought she looked like a pretty tasty snack. It would have been curtains for the little dog had Happy, her Rottweiler neighbor, not intervened. Luckily, the coyote saw the big dog and made for the hills, leaving Trixxie free to run back to her home. 6. Dolphin helps beached whales. Moko the dolphin saved a few of her whale friends who were beached on the New Zealand coast. Conservationist Malcolm Smith and his crew had been working for an hour and a half to get the stranded pygmy sperm whales back out to sea, but with no success. Then Moko, the friendly local dolphin, appeared and seemed to communicate with the whales to lead them back out to sea. As Smith told BBC, "The two whales changed their attitude from being quite distressed to following the dolphin quite willingly and directly along the beach and straight out to sea. 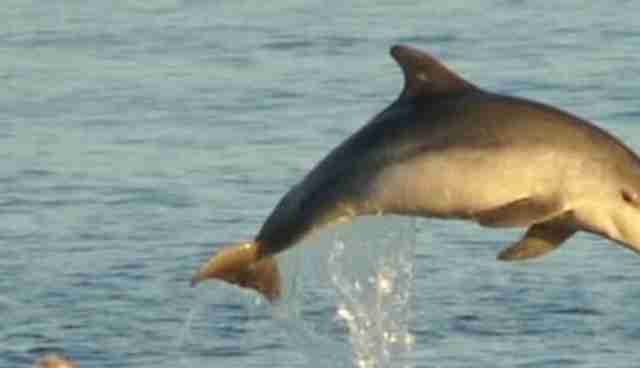 The dolphin did what we had failed to do. It was all over in a matter of minutes."